New York (TADIAS) — Enkutatash is around the corner and so is the fourth annual Ethiopia Fest Chicago, a colorful September festival in the “Windy City” marking the Ethiopian New Year. 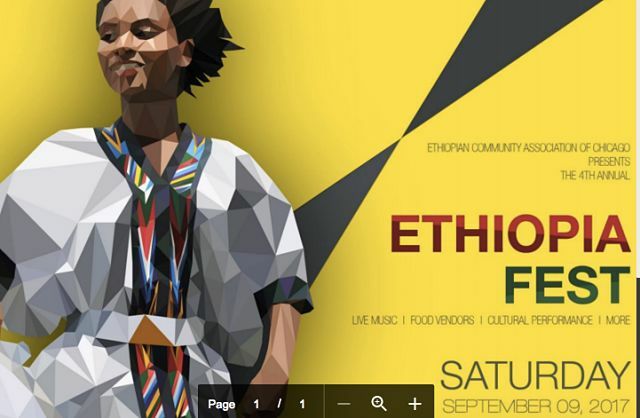 The Ethiopian Community Association of Chicago (ECAC), host of the weekend celebration scheduled for September 9th, announced that their holiday gathering this year features live music, food, fashion show, cultural performance and a gursha contest. “We are really excited to see Ethiopia Fest continue to grow bigger and better each year,” said Dibora Berhanu, Events Director of the ECAC’s Auxiliary Board. “This year we have all five hours packed with great entertainment and an array of vendors.” She added: “It will be a great way to spend a Saturday afternoon [celebrating] the beautiful Ethiopian culture.” The program also includes traditional Ethiopian coffee ceremony and poetry reading by up-and-coming artist, Tigist Dadi. The press release notes that the festival organizers have partnered with Ethiopian Airlines and offering a raffle of a round-trip ticket to any Ethiopian Airlines destination in Africa. “We also have many local sponsors including The Wild Hare, New City Moving, The African Life, The Meeting Point, Safari Lounge & Ethiopian Cuisine, Ian Sherwin Gallery, and Selam Ethiopian Kitchen” states the press release. Admission is only $5 and free for children under 5. You can purchase your tickets online or with cash at the door. For more information on Ethiopia Fest Chicago, please visit ethiopiafestchicago.com.